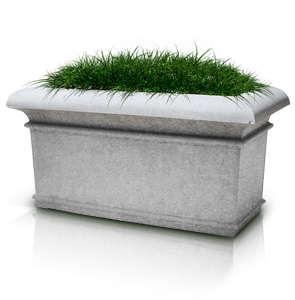 These concrete rectangle planters are ideal for lining sidewalks and walkways with decorative greenery to help give urban settings a natural look. The heavy duty concrete construction allows them to be used as security barriers and also enables them to support larger root systems. Concrete acts as an insulator during cold weather protecting plant roots from sudden temperature drops as well. All planters come standard with drain holes for proper drainage. Available color options and finishes shown below.